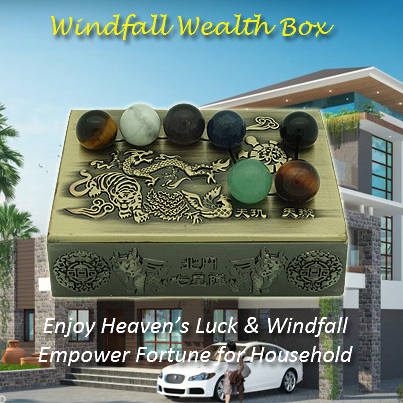 With the ability to develop new avenues of wealth growth and attract windfall, the Windfall Wealth Box lets you enjoy abundance filled with likelihood of windfall together with stable income streams. 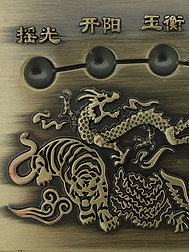 Being the premier symbol of "heaven luck", this ornament is devised using the BIG DIPPER FORMATION (a.k.a Northern Stars) to magnetize prosperity and unexpected financial gains. Heaven luck is not confined only to windfall alone. This type of luck has the ability to get rid of calamities, ward off disasters, transform adversities into blessings and to garner wealth and longevity. This ancient secret of activating the Big Dipper's energy being kept away from lay persons for thousands of years will benefit a household, a corporation, a leader and a partriarch/martriarch. As long as the tip of the stars is pointing to the east in spring, the south in summer, the west in autumn and the north in winter, this ornament can be displayed in locations such as your living room, dining room, foyer in the vicinity of your main door or at your office table. This will align the forces of your space to cosmic forces according to the big dipper and empower you with good fortune and windfall opportunities. 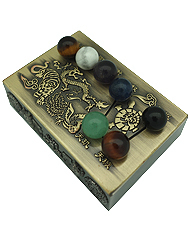 This wealth box is suitable to activate Heaven Star #6. For eg. in 2018, you can display it in the SW.
A. 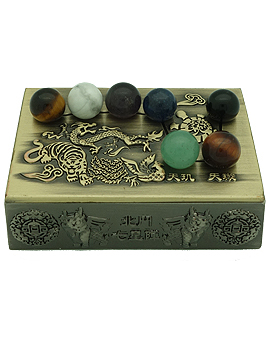 Seven Chakra Spheres consist of 7 colored semi precious stones, each related to a different chakra in our body. Chakra is an energy center meaning a wheel or circuit that rotates on its axis. The chakra spheres will overcome any unbalance energy field in a space, penetrate blockages in energy flow and sync up 5 elements to promote good fortune. Using principles of sacred Big Dipper geometry, the exclusive shape line up greatly enhances and strengthen the inherent beneficial energies of the crystal spheres. They can be randomly displayed in the holes along the big dipper line without following any color sequence. 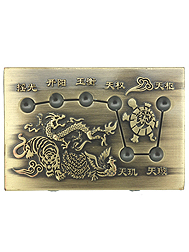 B. Taoist Big Dipper (7 Stars) Talisman featured under its lid are pure, authentic Taoist Talismans based on The Taoist Scripture "Mysterious and Numinous Big Dipper's Supreme Perfect Book for Prolonging One's Fundamental Destiny". 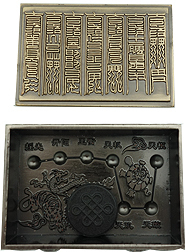 They are the same talismans used in the yearly "Luck Enhancing Ritual" by Feng Shui Masters of Taoist faith, and the charges are usually not cheap to obtain them. They contain 7 talismans of "Protecting Star Lords" that benefits and protect all the 12 Zodiacs. 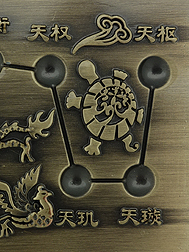 C. 4 Celestial Guardians namely the green dragon, the white tiger, the black tortoise and the red phoenix provide directional protection for the four cardinal directions. 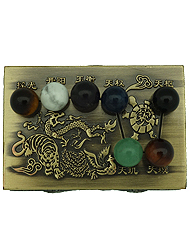 Known as the protectors of four directions, they provide a good balance in your surrounding energies so that wealth luck can be drawn to you. They also hold the key to effectively balance weak or missing elements of a space when it goes out of sync, and thus remedying elemental conflicts and imbalances. 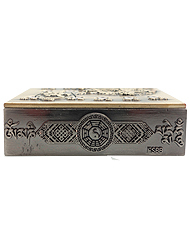 D. Six Syllable "Om Mani Padme Hum" Mantra is inscribed to consecrate the wealth box. This is the mantra of Avalokitesvara Compassionate Buddha who blesses all beings with wellness. The fillings provided for the wealth box include the followings:. 1. 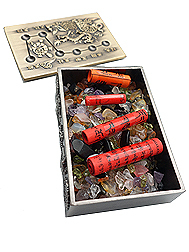 Seven Treasure Chips contain multiple gemstone chips such as citrine, rose quartz, amethyst, adventurine, hematite, garmite, lapis lazulli, tiger's eye and much more. This is the secret ingredient for the wealth vase, wealth bowl, wealth ship and a wealth box like this one. 2. King Gesar's Mantra - Kubera (Wealth God) brings serious wealth luck and continuous prosperity by dropping wealth to everyone he meets up. Riding on the Windhorse, he overcomes all obstacles that block wealth from manifesting. Enables you to gain the victory advantage. This means you will have a smooth, easy and unobstructed ride in your undertakings. 3. Four Dharmakaya Relic Mantras - Are essential mantras that give power and make the object holy. 4. Wishfulfilling Mantra - Promises you a quantum change in making your impossible wishes possible. It opens up endless possibilities, superlative success, overflowing possibilities and materializes your dreams. The magic created will move events, people and circumstances to fulfill all your dreams. You will be unrestrained and seeing enormous changes that leads to boundless returns. 5. White Jhambala Mantra - According to Buddhist mythology, he practiced Buddhism for a thousand years before Brahma made him immortal and have him guard treasures and distributing wealth to eliminate poverty and provide financial stability. It is said that riches attained from Jhambala comes with a wealth of spirituality. Where to display the Windfall Wealth Box? 1. In the family hall to channel positive heaven luck for the whole family, with good health, prosperity, safety and smooth career. 2. At the work desk to enhance authority, unshakeable career stability and increased income stream. 3. At your personal zodiac corner to reap windfall luck: Rat - North; Ox - NE; Tiger - NE; Rabbit - East; Dragon - SE; Snake - SE; Horse - South; Sheep - SW; Monkey - SW; Rooster - West; Dog - NW; Pig - NW. 4. In the Partriarch's corner (Northwest) to benefit the ambitious man of the family who desires to become a tycoon and own a business empire. 5. In the Martriarch's corner (Southwest) to benefit the ambitious woman of the family who desires more authority, power, fame and financial success. 6. 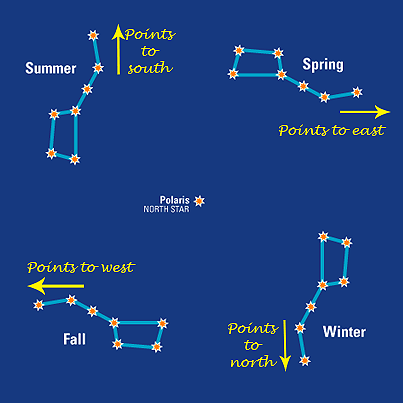 In the direction of Heaven Star #6 whether it is in the natal, annual or monthly flying stars chart.